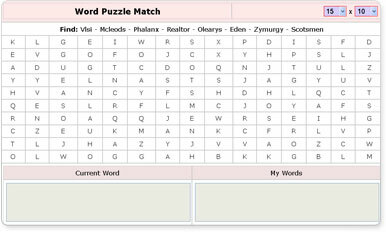 Word Search Puzzle game features a completely customizable template, easy integration into a current application, custom dictionaries, an easy to edit file with custom settings, puzzle length and width customization, automatic complexity settings, easy coloring and word selecting with a checker, and more. Easily integrated into current application. Custom dictionaries (comes with 7). Easy to edit file with custom settings. Puzzle Length & Width changeable via form. Makesafe file to insure added dictionaries are "puzzle" safe.